The most obvious difference with this soaking tub from others it the nickel plating on the inside that give it a silver look. 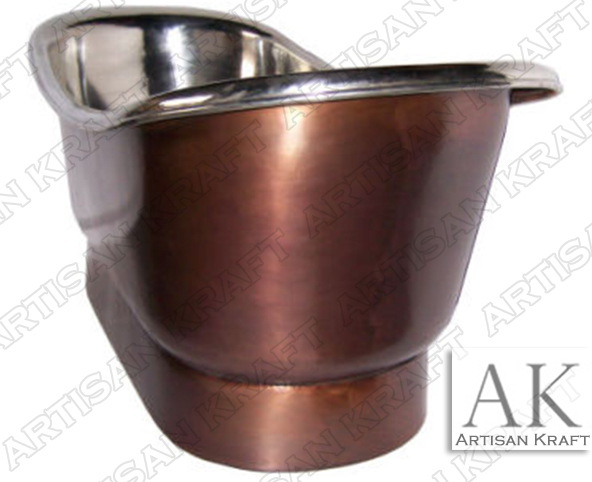 This is perhaps the most popular design for a freestanding copper bathtub. It has a pedestal with a double slipper. A smooth finished exterior versus a hammered finish. It is a lightweight yet very durable soaking tub making it easy to install. The light weight also makes it more coast effective to ship to California and Florida. This is an easy and fast way to immediately upgrade your bathroom. Weather it is for your own benefit or if you are trying to sell your home. A great design idea. View this in an all copper tub finish.